2016 Yamaha Bolt, CLICK HERE For Factory Promotions. 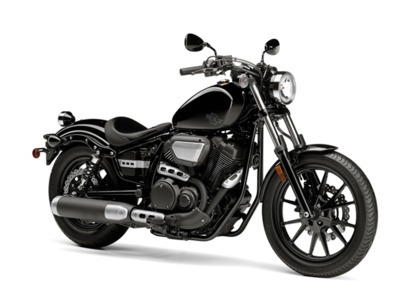 2016 Yamaha Bolt WELCOME TO GENERATION BOLT The Bolt features compact, raw bobber design and a powerful 942cc V-Twin for a perfect union of old-school style and modern urban performance. Features May Include: Urban Performance Styling: The Bolt® is stripped down, devoid of chrome parts and epitomizes the Urban Performance Bobber look. The compact chassis proudly showcases the 58 cubic inch (942cc), air-cooled, 60° V-twin sitting at the heart of the bike. High-Tech Engine: The Bolt uses modern technology to create a riding experience superior to other similarly sized machines. Even fuel injection and ignition timing maps have been carefully chosen specifically for this bike to deliver class-leading performance with strong low- and midrange torque sure to bring a smile to every rider s face. Compact, Stable Chassis: The slim body and low seat design combine to give the motorcycle light maneuverability and a stable handling feeling. The upright riding posture helps the rider feel the wind, hear the sounds and experience the pulse of the machine. Ready to Customize: For riders who value personalization, the options for the Bolt are limited only by the owner s imagination. As we say at Star® motorcycles, We build it. You make it your own. ® And as the perfect canvas for customization, Bolt is the ultimate example of that philosophy. Unique Bolt Persona: Components such as the 3.2 gallon fuel tank, belt drive, front and rear wheels, digital meter and steel fenders combine to create a distinct look in the Star Motorcycles line-up. Modern Air-Cooled V-Twin: The 58 cubic inch (942cc) engine is an air-cooled SOHC 60º V-twin with four valves per cylinder, a pent-roof shaped combustion chamber, and 9.0:1 compression ratio. The engine is designed to provide excellent power and superior low-end torque. Advanced Cylinder Design: The combustion chamber shape was precisely engineered to direct the fuel/air charge to the center of the piston for more efficient combustion and maximum power. Ceramic-composite plated cylinders provide excellent heat dissipation and reduced oil consumption. Unique Bolt Exhaust System: A 2-into-1 exhaust pipe layout on the right side of the engine contributes to the lively performance and styling of the machine. The minimalist-style exhaust system delivers a throaty and pleasing exhaust note.